Singapore leads the way in a 10-country race in the ASEAN to protect public health from the harms of tobacco use according to the Framework Convention on Tobacco Control (FCTC) Scorecard launched by the Southeast Asia Tobacco Control Alliance (SEATCA). While standardized packaging of tobacco or ‘plain packaging’ is widely regarded as the best way to package tobacco, no ASEAN country has yet implemented this measure. All countries, however, require pictorial health warnings on packages, although some require them only for cigarettes and not for other (e.g. smokeless) tobacco products. Thailand leads with the largest pictorial health warnings (85% front and back). The scorecard is available at www.seatca.org. from Namibia, which is choosing to grow more food crops. The industry has gone on the offensive: conducting an international campaign to attack and discredit the COP and the World Health Organization (WHO) about lack of transparency. Industry representatives have written angry letters to both the COP and WHO and published many statements in the media criticising the COP’s lack of ‘transparency’, which strikes a chord with broader society. The letter was riddled with false accusations against SEATCA, mischaracterisations of fact and law, disparaging comments about the WHO, the Framework Convention Secretariat and FCTC Parties. SEATCA published an open letter in response. In September, Johns, a former Australian Labour Minister, released a publication attacking WHO for not conducting its business in “transparent fashion and in public view.” The tobacco industry publicised his report in the Tobacco Reporter. Another industry front group, the International Tobacco Growers Association (ITGA), which routinely rounds up its members to rabble rouse at COP sessions, has stepped up its misinformation campaign. ITGA’s Indian member Federation of All India Farmer Associations (FAIFA) has been applying pressure on the Indian government to allow its members to the COP using arguments of “principles of transparency and equity”. While the Philippines has made significant improvement to control tobacco industry interference two years after it had ranked high among Southeast Asian countries that reported industry influence, much is still needed to be done to protect the government from unnecessary interaction with cigarette makers. The report, the world’s first ever assessment of tobacco interference in government, and the third one by SEATCA since 2014, reveals that the industry invests huge money on CSR activities to circumvent laws regulating their business and gain access to public officials in charge of implementing tobacco control policies. “We have a Civil Service Commission guideline that prohibits unnecessary interaction between government and the tobacco industry. Despite that, the industry is able to continue to exercise some influence in government affairs through fake CSR using legitimate business organizations and foundations that lend support to local government units,” Rojas said. Rojas was referring to the CSC’s Joint Memorandum Circular 2010-01, a code of conduct banning all government officials from receiving or supporting tobacco industry-related CSR activities. SEATCA noted that while more than 200 national and local government units, including educational institutions and government controlled corporations, have supported the memorandum and drastically reduced unnecessary interaction with the tobacco industry, it still was able to contribute to LGUs through the American Chamber of Commerce which fronts for Philip Morris Fortune Tobacco Corporation (PMFTC) and Mighty Corporation’s Wong Chu King Foundation (WCKF). SEATCA revealed that as ASEAN countries implement stricter bans on tobacco advertising and promotion, cigarette giants such as Philip Morris International have recently increased their CSR spending in the region. “Philip Morris International (PMI), for example, increased its spending in three countries (i.e., Malaysia, Philippines and Thailand) in the ASEAN region from USD 1.5 million in 2009 to USD 2.5 million in 2015,” the report said. “PMI spends the lion’s share of its CSR handouts in Indonesia and the Philippines, about USD 6 million and USD 1.8 million respectively, which are also its largest cigarette markets among ASEAN countries,” added the report. Rojas said the tobacco industry should be banned from using their “fake” CSR activities because they run counter against the Framework Convention on Tobacco Control guidelines signed by member countries including the Philippines. Tobacco control advocates are familiar with the “scream test” – the litmus test for an effective measure that hurts the tobacco industry and causes it to protest. Recently, a regional tobacco control group, the Southeast Asia Tobacco Control Alliance (SEATCA) received a 36-page letter from Dr Gary Johns on behalf of the International Tax and Investment Center (ITIC) which shows the industry screaming. The ITIC is a think tank based in Washington DC that claims to be an independent, non-profit research and educational organisation supported by 100 corporations including four transnational tobacco companies (BAT, PMI, JTI and Imperial Brands), each of which are represented on its board of directors (http://www.iticnet.org/Sponsors_BoardOfDirectors). Dr Gary Johns is an Australian consultant “engaged by ITIC to engage with its critics”. The letter sent to SEATCA is riddled with false accusations against SEATCA, mischaracterizations of fact and law, disparaging comments about the World Health Organization (WHO), the WHO Framework Convention on Tobacco Control Secretariat (FCS) and the Parties to the FCTC. What had SEATCA done to bring about this tirade? In 2012, the ITIC and Oxford Economics (OE) released a report on illicit tobacco trade, Asia-11 Illicit Tobacco Indicator 2012 to provide evidence of illicit trade of tobacco products of 11 countries in Asia. The ITIC later launched an updated version, Asia-14 Illicit Tobacco Indicator 2013”, expanding the review to 14 countries in Asia. Both reports were funded by Philip Morris International (PMI). SEATCA published critiques of both reports. The first, More Myth than Fact provided an expert review of the methodology of the Asia-11 report, questioning the reliability and accuracy of the estimates of illicit consumption. The second, A Critique of the ITIC/OE Asia-14 Illicit Tobacco Indicator 2013, pointed out that the report failed to provide scientifically sound and unbiased information. The figures and statistics used in the report were products of either incorrect or unverified/unverifiable estimation methods, applied to often questionable data from multiple, disparate sources. It appears that PMI wants to steer governments away from WHO FCTC Article 5.3, which aims to protect public health policies from tobacco industry interference, and would rather governments participate in industry sponsored programs and adopt its recommendations on tobacco taxation. In November 2014, the ITIC organized a briefing for governments attending the sixth session of the FCTC Conference of the Parties (COP6) in Moscow hoping to dissuade them from their decision to adopt Article 6 guidelines on tobacco tax. However, the Framework Convention Secretariat (FCS) was able to caution governments in a timely manner about this ITIC meeting by issuing a Note Verbale in September 2014. In February this year, SEATCA’s Executive Director received a letter from ITIC’s President inviting her to a ‘roundtable discussion’, particularly “an experts’ meeting of professional economists” which SEATCA declined. 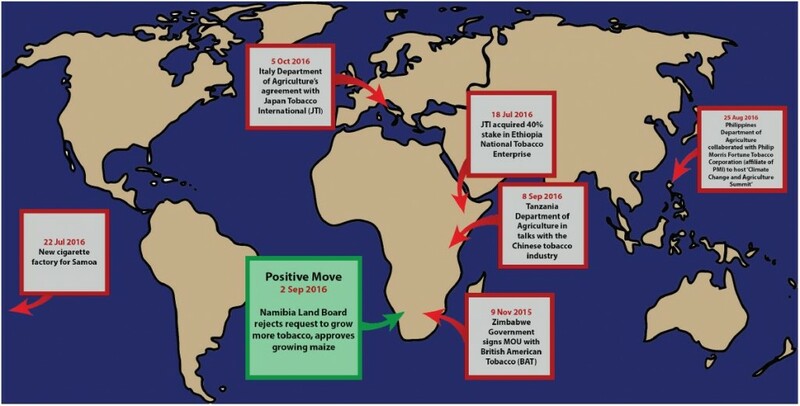 In March, the FCS issued a second Note Verbale on tobacco industry interference on the tracking and tracing systems, again making reference to the ITIC. Dr Johns wrote to an internationally renowned Thai tobacco control leader requesting them to urge SEATCA to meet with him about the critiques of ITIC reports. However, SEATCA has a policy of not engaging with the tobacco industry or its representatives. Dr Johns made another effort by phone and email, and failing to secure a meeting hand-delivered the letter in April. Because SEATCA does not engage with the tobacco industry or individuals or organisations representing it, it decided to publish an open letter in response to Dr Gary John and the ITIC. Among the many accusations the ITIC makes is that SEATCA “sees itself as an instrument of the World Health Organization and its Framework Convention Secretariat”. This statement undermines the credibility of the many international and regional non-governmental groups that work closely with inter-governmental organisations. SEATCA is a civil society alliance that works independently of the WHO and FCS. Like many other tobacco control NGOs, SEATCA has observer status with the FCTC COP. Observer status with the COP does not make SEATCA an instrument of the COP. SEACTA is an NGO in a developing country which carries out its activities in countries in the Southeast Asian region. ITIC’s letter, with its intimidating tone, appears aimed at bullying SEATCA in its efforts to expose the tactics of PMI and its representatives. This type of intimidation has a larger impact in a developing country setting as it aims to discredit a tobacco control NGO that works closely with governments. On April 21 2016, the Southeast Asia Tobacco Control Alliance (SEATCA) received a letter from Dr. Gary Johns, on behalf of his client the International Tax and Investment Center (ITIC). The letter is riddled with false accusations against SEATCA, mischaracterizations of fact and law, disparaging comments about the World Health Organization (WHO) and the FCTC Convention Secretariat (FCS) and the Parties to the FCTC. Because SEATCA does not engage with the tobacco industry and its representatives, it has decided to publish an open letter in response. We are taken aback by the accusations hurled against our organization and we find unacceptable the disrespect shown to us. We feel it is necessary that this intimidation ceases and that the misinformation you conveyed is addressed. The letter you wrote on behalf of ITIC contains false accusations against SEATCA, disparaging remarks about the World Health Organization (WHO)/ Framework Convention Secretariat (FCS), misinterpretations of facts and law, particularly of Article 5.3 of the WHO Framework Convention on Tobacco Control (FCTC), the first public health treaty negotiated under the auspices of the WHO. You also used rulings/opinions from authorities of five governments, namely Philippines, Germany, India, Netherlands, and European Commission, to attempt to show that “the work of ITIC does not violate Article 5.3 and the Convention,” when none of these governments have in any manner, in these documents or elsewhere, made an official announcement to that effect. Let me start by stating that SEATCA is a non-profit, civil society organization working to save lives from the many devastating harms of tobacco use. We take our work very seriously, because of the six million deaths (of which half a million are from the ASEAN region) caused annually by tobacco products that are made, promoted, and sold by profit-oriented tobacco companies. On the other hand, it is quite plain to see that ITIC represents the interests of the tobacco industry. Aside from the fact that ITIC has a longstanding relationship with the tobacco industry (as documented on the University of Bath’s tobaccotactics.org website) and that executive officials of the four largest multinational tobacco companies sit on the ITIC board of directors, ITIC has made statements and published reports that advance tobacco industry interests, and at least two of such reports were financed by Philip Morris International. You asserted that “ITIC does not work on any public health issues” hence, its work on tobacco taxation does not take into account the World Bank’s identification of tobacco tax increases as a cost-effective measure for tobacco control and a key intervention for health outcomes. It completely ignores the fact that tobacco taxation had been classified as a public health issue by Parties to the FCTC. Disregarding the public health dimension of taxation as documented in the FCTC and its guidelines is an affront to the collective wisdom of the 180 governments that adopted the guidelines based on international best practice. The critiques of ITIC’s three reports are well-researched, detailed, and as accurate as possible. These were written in collaboration with much-respected professionals. On this note, we want to point out the sheer inaccuracy of your statement: “Of 180 Parties to the Convention only 16 are signatories to the Protocol to Eliminate Illicit Trade in Tobacco Products.” Publicly available information shows that there are 54 signatories to the Protocol. And there is no mischaracterization of ITIC’s role because, as stated above, it represents the interests of the tobacco industry. Asserting that a civil society organization lacks transparency and accountability in the same breath as challenging the messages it sends is a distasteful way to silence civil society voices. We refuse to dignify this approach by providing you with organizational information but suffice it to say that you would have found all the information you needed if you looked in the right places. SEATCA does not engage with the tobacco industry and its representatives. SEATCA’s decision is soundly based on the principle that there is a fundamental and irreconcilable conflict between the tobacco industry’s interests and public health policy interests, a guiding principle fully recognized by the 180 States Parties to the FCTC. This principle is the basis for the state’s obligation to protect tobacco control policies from the commercial and vested interests of the tobacco industry (FCTC’s Article 5.3). SEATCA is actually open to discussion with partners other than the tobacco industry and those representing its interests in accordance FCTC’s Article 5.3. Referring to it as “false protection,” shows disregard for the treaty and the Parties’ commitment thereto. You also mention Article 5.3 Guideline’s transparency provision but left out the essence of it, which is to require transparency from the tobacco industry and from those who interact with it when strictly necessary for regulation. This statement undermines the credibility of many international and regional non-governmental groups that work closely with inter-governmental organizations. SEATCA is a civil society network that works independently of the WHO and FCS. The fact that SEATCA was granted observer status by the FCTC Conference of Parties (COP), like many other organizations, does not make it an instrument thereof. Such a statement is also laden with innuendo that there is the possibility for the FCS to be treating civil society organizations as “instruments.” This type of reference could damage the reputation of the FCS as it undermines the trust and partnership developed by the FCS with CSOs over time. In addition, the criticism you made of the WHO/FCS having “excluded reputable authorities such as Interpol from its illicit trade work” is actually a direct challenge to the judgment made by a body comprising of about 180 governments (the COP); for it is the COP that decided to defer reviewing Interpol’s application as observer due to the organization’s receipt of tobacco funding. Finally, you claim that ITIC’s repeated attempts to engage were in good faith. And yet, by your own admission, you stated that ITIC’s aim was “to provide opportunities (for SEATCA) to rectify (its) comments and mischaracterization.” Attempts to engage with the intention of making the other party rectify supposed errors show prejudice and are not a manifestation of good faith. SEATCA will not tolerate any more offensive statements. It is simply unacceptable for organizations representing the multinational corporate sector to intimidate civil society organizations that support government implementation of a human rights and public health treaty that aims to prevent deaths from a deadly product.